Allen's Board | It never rains underwater! As a volunteer scuba diver at the Newport Aquarium I have been giving talks to the visitors for more than 10 years about sharks, while I am swimming comfortably in the Shark Tank. One of the messages of these talks is how important sharks are to our environment. They keep the ocean healthy so the ocean can keep us healthy. In addition to being the source of much of our food – the ocean produces as much as 80% of the earth’s OXYGEN that we all depend on to survive. And yet, in the orient (means east) there is a practice called FINNING. In the practice of finning, fishermen catch sharks and bring them aboard their boats and cut off their fins. The sharks are then thrown back into the water without their fins where they die, because they cannot swim without fins. As many as 200,000,000 (two hundred million) sharks a year are killed in this fashion for this purpose. What are they killed for? To make soup! Shark Fin Soup! In some parts of the orient this is considered a delicacy and people pay as much as $100 for a bowl of this soup. Finning is outlawed in many countries but NOT everywhere. Here’s a recent news report. This morning I was reminded of one of my pitches at the Newport Aquarium. I’m a volunteer scuba diver at the Newport Aquarium. What I like to do there is scuba dive in the Shark Tank and talk to people about sharks, marine life, and the like. When we talk about doing our part to help marine life and the ocean environment people say to me “Allen, what can I do living in Cincinnati far from the ocean that can help the ocean?” That’s a good question. What I say is that way back up the chain here inland we can have an affect on the sea. Things flow downhill – not only water but trash also. We recommend recycling. This will keep some of our trash from getting washed out to see. Think about plastic – it takes forever to break down and disintegrate. 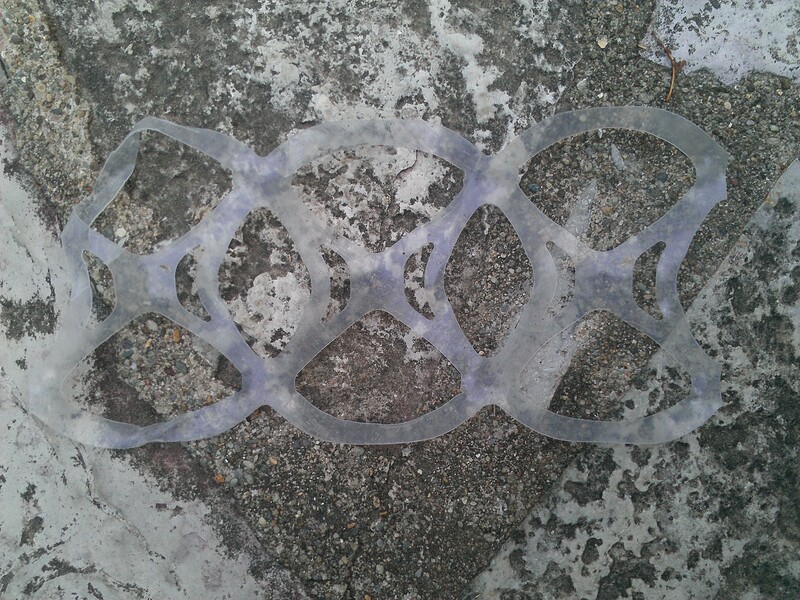 Think about those plastic ring things that hold six-packs of cans together. In the sea these things get caught on animals or get ingested by animals and can even cause death. These things start out somewhere and some of them come from Cincinnati. This morning I was walking with http://www.facebook.com/TheRealLola and we did a good deed. We saw one of these things laying on the ground and we brought it back to our recycling/trash bins. Otherwise, this could have been washed away, made its way to the river and eventually to the sea. Allen Miller of Hyde Park, Cincinnati was recently appointed to the position of Area Ambassador for Volunteers for Israel. Allen will perform this function for southern Ohio, northern Kentucky and southern Indiana. Volunteers for Israel – USA (VFI-USA) is associated with Sar-El, a non-profit organization in Israel, which administers the program in Israel. Volunteers typically spend two or three weeks living and working alongside Israelis, at an army base, Israeli Defense Forces warehouses or service bases. The program offers a way to contribute to the State of Israel in a very direct way. Allen is available to speak to groups and individuals about his experiences with the VFI/Sar-El program. For information, call or e-mail Allen at 513-321-5120, Allen@MillerManor.net or visit the VFI-USA website http://www.vfi-usa.orgor Allen’s blog at http://bit.ly/vfi-ahm. We went to Cleveland for the weekend to participate in our niece’s Bat Mitzvah. It was a great time getting together with family. On our way leaving town today we stopped at a place where much of my family resides – Warrensville Cemetery. 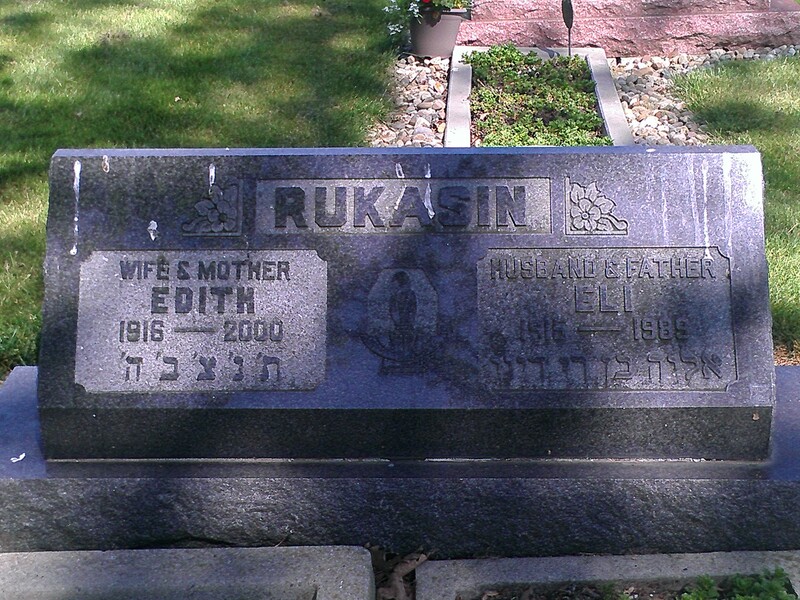 While walking around visiting the graves of my parents and all four of their parents I spotted a grave that I had not noticed before, that of Eli Rukasin and his wife. Eli Rukasin was a great man from my youth and the youth of many friends when we were growing up. Eli owned and operated Rukasin’s Drug Store. Back then it was commonplace for drugstores to be small businesses that included a soda fountain complete with a row of stools. Eli supported the neighborhood. He was willing to hire underage guys (I can’t remember any girls that worked there) to work the cash register and the soda fountain. I never worked there but I spent a lot of time there and many of my friends did work there. It was a great place to stop at after school for a soda and/or a new comic book. Once a year there would be a community parade on Memorial Day. The parade included a collection of marching bands and other groups that all were uniformed and very nice looking. This parade started from Oxford Elementary School in Cleveland Heights. Eli was the guy that formed a band every year with the people that weren’t fortunate enough to be in a serious marching band. Eli would let anyone that had an instrument join in. 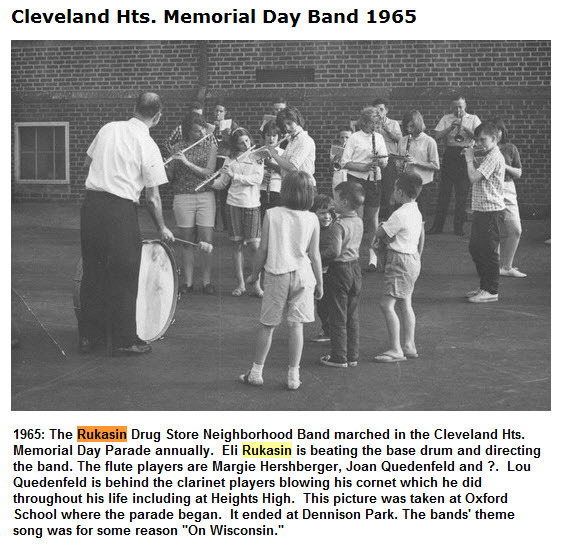 They would practice a couple times up at the playground and then on parade day this group of all kinds of folks made up the Rukasin band and they were as proud as any other group. It was nice running into an old friend today. Back (a few weeks ago) from a fun trip where a group of scuba divers from the Newport Aquarium did a road trip and we got to go diving at the Georgia Aquarium. Here’s the video. I’m kind of excited about this. The Newport Aquarium has organized a trip to the Georgia Aquarium in Atlanta next month. I visited the GA a year or two ago and really enjoyed it. That time I was a regular visitor. This time a bunch of the NA Dive Crew will be going as a group. We will get to take a ‘behind the scenes’ tour of the GA. IN ADDITION, we will get to scuba dive and/or snorkel in their LARGE tank. Let me try and put this in perspective for you. The large tank at the NA is just under 400,000 gallons of salt water. The large tank at the GA is about 6,200,000 gallons! 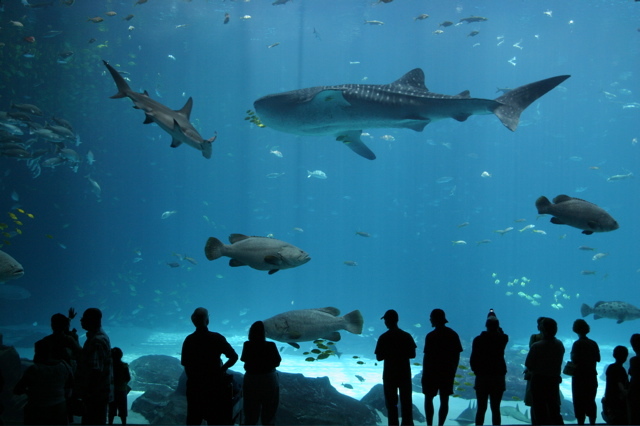 Along with the myriads of fish and marine animals in the large GA tank are 4 Whale Sharks. These guys, as adults, run from 20 to 30 feet long – the longest recorded actually at 40 feet. These huge animals are – vegetarians – so there shouldn’t be anything to worry about – at least for us non-vegetables. Here is a picture I took when I was at the GA. The large animal with the spots is a Whale Shark.